Halswell: The Grotto (or Rockwork Screen) of c. 1754. The history, purpose, later uses and relative obscurity of this fascinating feature makes it one of the most interesting of the eighteenth-century architectural additions to Halswell by Sir Charles Kemeys-Tynte. William Kent (1685-1748) was England’s first great landscape designer and his influence throughout the eighteenth-century was immense. 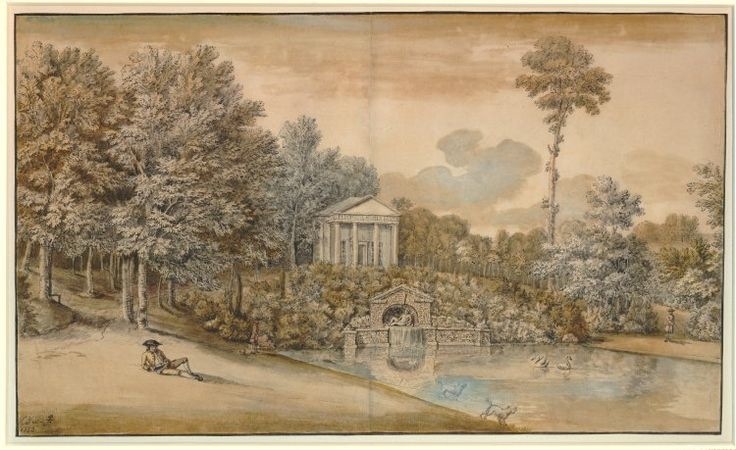 In many ways he was a man before his time but his insights into the Arcadian Landscape were taken up by other great designers who came after him, such as Capability Brown (1716-1783). 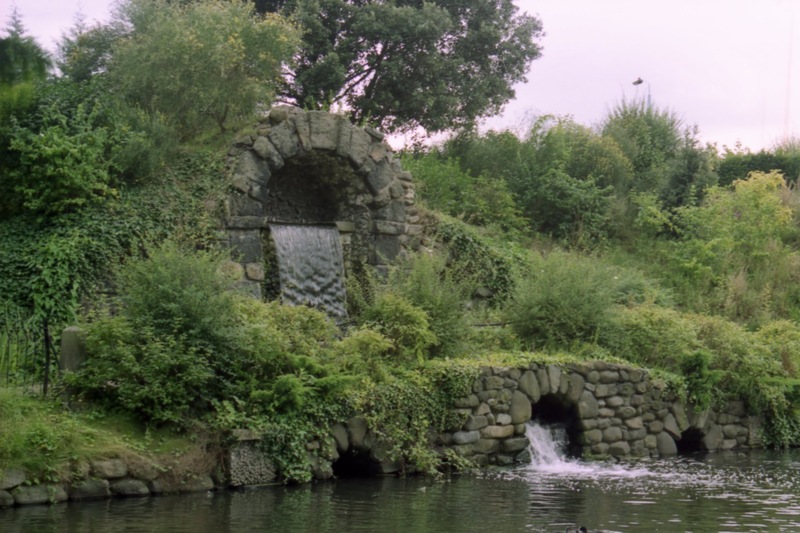 His work on such grottos as those at Burlington House and Rousham had a direct influence upon Halswell’s Grotto which served as a dam, grotto and, originally, a water cascade. William Kent’s 1738 cascade for Lord Burlington at Chiswick House, London. William Kent, Rousham, Oxordshire, for General James Dormer-Cottrell, also 1738. “1754. The Rock work at the head of the canal on the lawn made.” – Escott’s memorandum. 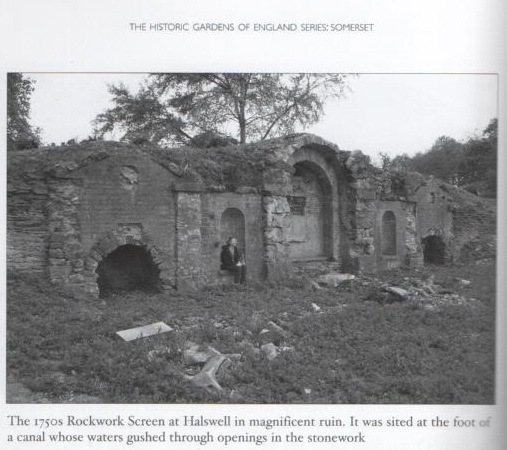 From the estate steward’s diary we know a rockwork feature was created at the pond in 1754. The term we use, ‘Grotto’, for the feature that Mr Escott referred to as ‘The Rock work’ is the term used on all maps that denote the feature and though it is often called ‘the Rockwork Screen’ this is mainly to differentiate it from Mill Wood’s Cold Bath Grotto, but also arises from a justifiable confusion as to the features original and later purposes. 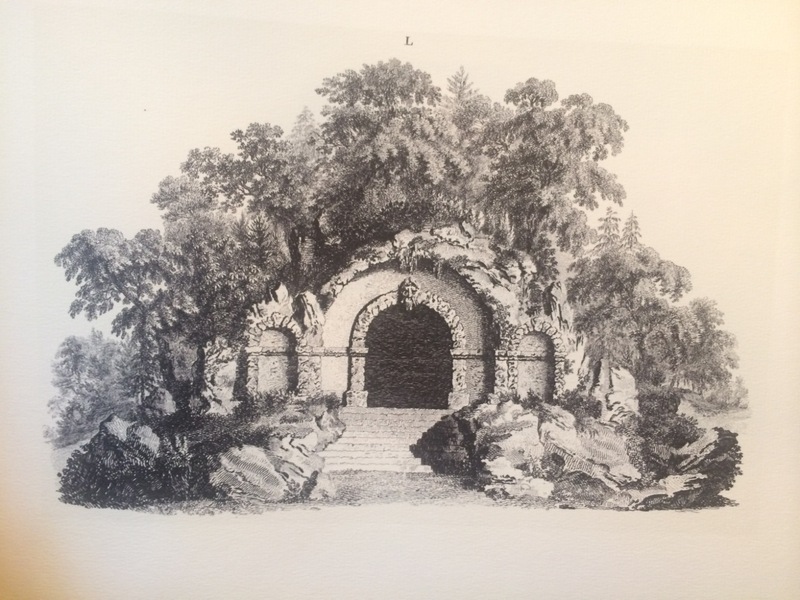 The date of 1754 is very significant as it predates Thomas Wright’s published designs for grottos by four years. 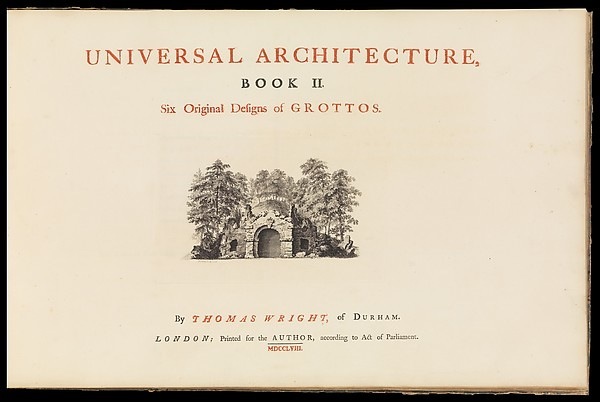 Sir Charles was a patron of this publication and the similarity in design of Halswell’s Grotto and those outlined by Wright, in a book sponsored by Sir Charles, seems far more than just coincidental. 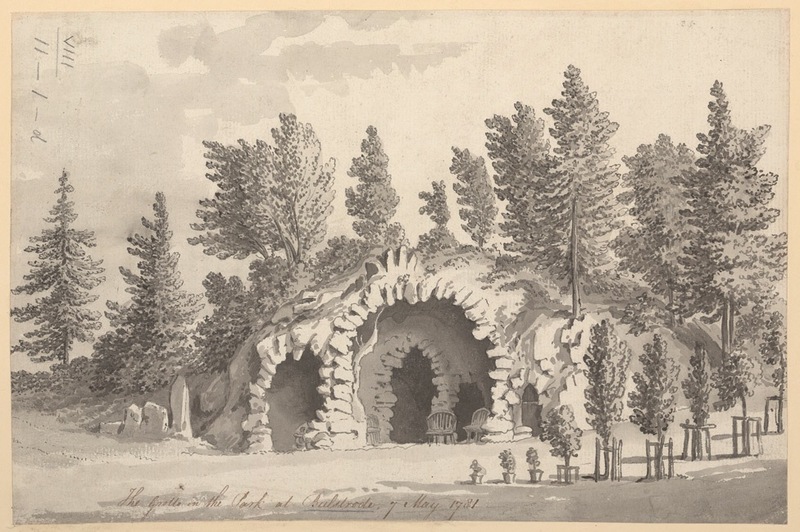 A reasonable guess might be that Wright created the Halswell Grotto in 1754 and as a continuation of those ideas wrote up a variety of designs on the same theme for future publication. 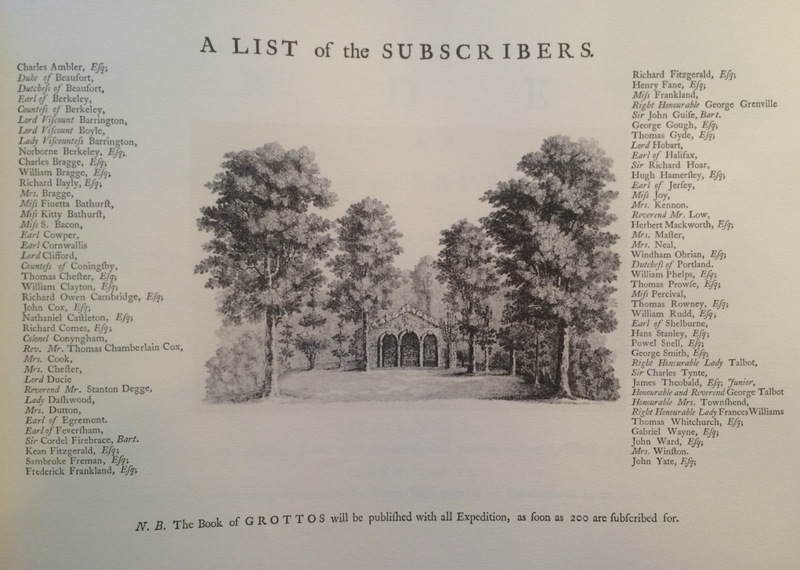 Sir Charles sponsoring a publication outlining grottos, one of which he had already built himself and therefore had no use for this design book’s contents, might seem superfluous had he not already used Wright’s expertise and had a continuing professional relationship with him. The position of this Grotto at the northern end of the pond seems through recent archaeological examination to have been a new decorative screening façade covering a pre-existing dam, which itself must have had an outflow of water creating some form of cascade. The evidence for this earlier cascade is now long lost due to the Grotto façade and later eighteen-century modifications. At the top of the Grotto was a rusticated stone hump-backed bridge which like the Bath Stone Bridge in Mill Wood appeared to be a bridge from the water elevation but from the other side was in fact a dam with a water cascade outflow. Water appeared to flow beneath this bridge but in fact gathered in a lead tray before passing under the hump back bridge and falling out through the top of the central arch of the grotto screen below on the opposite side. The design of the rusticated stone used is the very same as that used in the cascades throughout Mill Wood, including the Cold Bath Grotto where the water rises from the earth. The continuation of the same worked stone would suggest an overriding scheme or designer was at work throughout all the water features at Mill Wood, and this Grotto closer to the house. 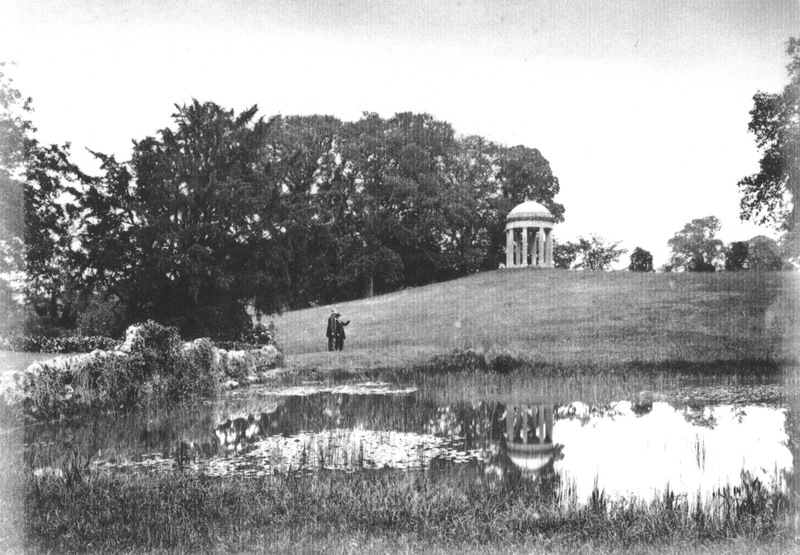 The rusticated stone bridge on top of the Grotto, photographed from the north lawn in the 1890’s. Water from the pond would appear to flow under this bridge on the left (obscured by foliage), but by 1771 this water cascade on the outflow side was removed and subterranean pipework fitted to take the overflow of water away invisibly and down to the ponds near the gate lodge. Jacob de Wilstar’s map of Halswell, 1756. William Day’s map of Halswell, 1771. 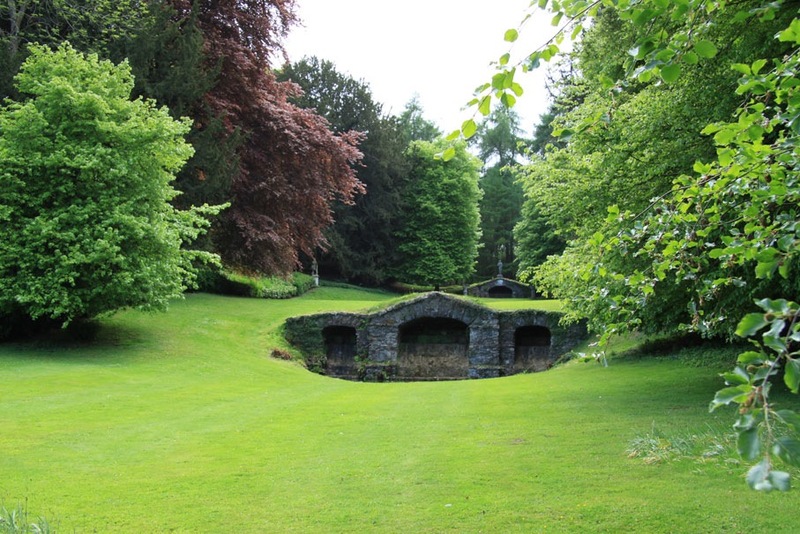 This Grotto sits at the northern bottleneck of the 1756 map where the long ‘canal’ pond meets a large circular pond. 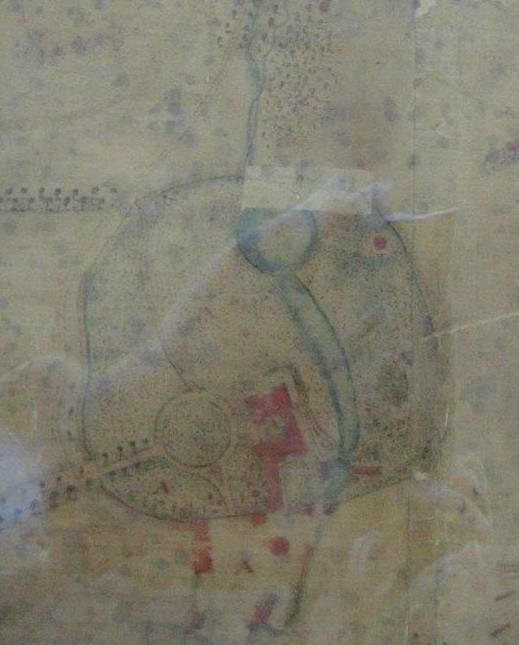 This circular pond had already been removed by 1771 when a new map was commissioned. This change will have completely transformed the effect of water at the Grotto, at this date the stones and encrusted mineral specimens would have reflected against the pool of water which seems to have abutted the Grotto. The inclusion of the circular pond dictates that water somehow flowed down to it from the canal pond above: how and where that water flowed has been a subject of debate over the years. 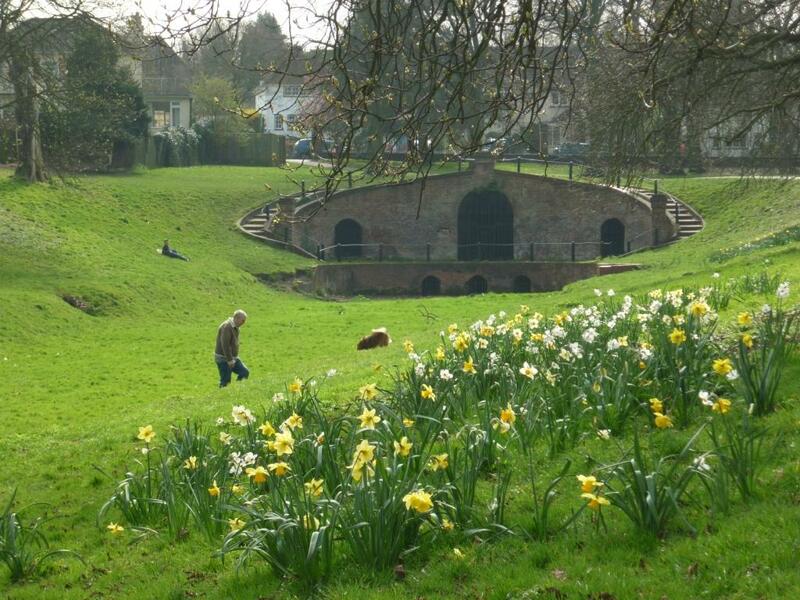 How the water left the canal pond and reached the circular pond is the key to the original design scheme, and therefore will influence the decision on how to restore the Grotto. 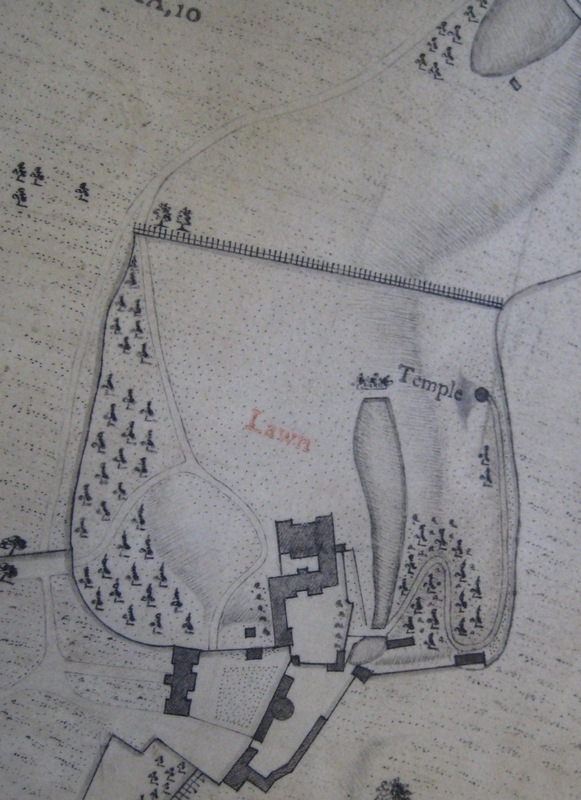 The archaeology has now shown that the Grotto was added after the dam behind it and that the flow of water down to the gate lodge ponds (top of the 1771 map) then became subterranean rather than above ground as in 1756. The foliage around the Grotto is already established enough to be recorded as heavy growth in this 1771 map, which would be welcome in a grotto, possibly less so in an expansive pond system as it was in 1756. The Rotunda, recorded on both maps, sits on the hill above. The physical evidence now suggests that the largest arched niche was originally open at the top, similar to that at Chiswick House, illustrated above. However why this feature seems to have been blocked up so soon after its construction – it lasted roughly fifteen years – is unknown. The simple explanation is that the water flow in the summer months was inadequate to support a running cascade and such a large circular pool of water beneath it. We have discovered a large amount of silt behind this central arch which seems to confirm this was a water transit route. T. Bonner, etching published in Collinson’s Somerset, 1781. 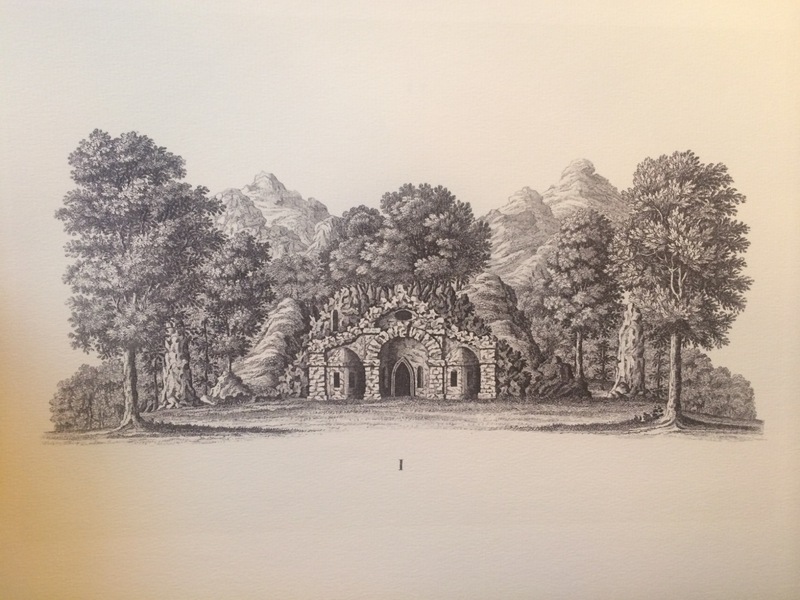 Historic images of the Grotto at Halswell are very rare; this print provides the most detail. Where water did not run, at least there are no physical post-1771 remains, are under the two outlying arches. These appear to have always been closed arches, which, if water directly abutted the Grotto, they would have been filled with water at their bases and given the impression that the Grotto was built in the water, with a cascade flowing down from its highest point in the centre. This might also suggest that the now empty niches originally held statues of water nymphs of some sort. Though niches are very often left empty, in this case that would seem unlikely as the presence of statues here would have added greatly to the effect that a grotto was intended to produce. But re-opening this water route is not as simple as all that. Placed over this opening is a large eighteen-century plaque, now so degraded that its inscription has flaked away. The top section has also broken off and is lost. 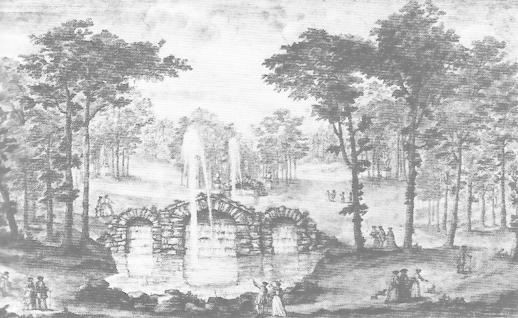 This scheme probably dates from 1771 or before when the function of the Grotto was transformed and its cascade removed. To re-instate the 1754 water cascade throws up some interesting restoration-versus-conservation issues. What point in history do we re-create? Complicating matters further there are also many missing pieces of the Grotto, most of which have simply fallen to the ground below and we can restore to their correct positions. However there are other, probably more detailed features, which have been removed, no doubt scavenged over the years. The keystones to each outlying arch are missing and there are two regularly positioned holes in the smooth ashlar facings directly above these keystones. These probably held carved stone features such as shell-work or portrait heads denoting river gods or similar. If we look at the drawings of Wright we can see bearded heads as keystones, no doubt representing classical, masonic or other allusions. 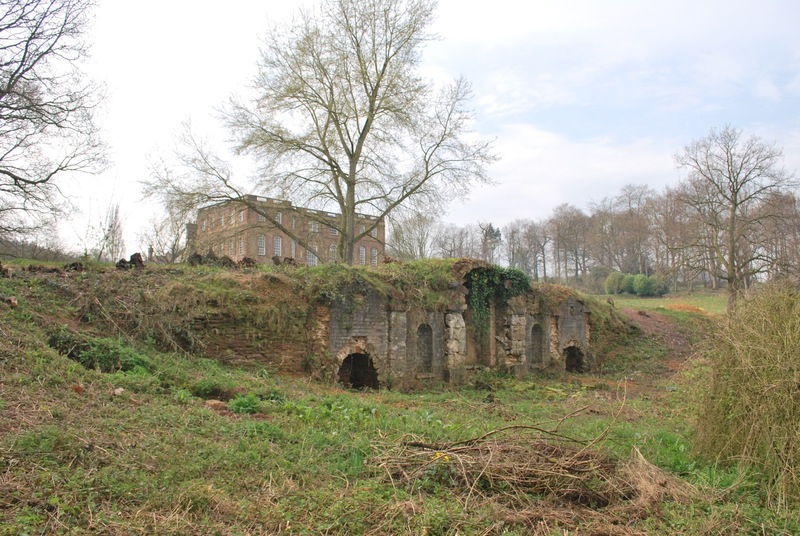 Halswell’s Grotto and rusticated bridge are recorded below in detail by Architectural Thread Ltd. with excavations by James Brigers and Corbel Conservation. Only by picking apart the details of the screen, dam and bridge’s construction can the original sequence and functions of the feature be made clear. Once a fully convincing understanding of the feature’s original function is decided upon the full restoration can continue. Sir Charles was engaged in a relentless search for the beautiful and picturesque in landscape and landscape architecture. With his friends Coplestone Warre Bampfylde from Hestercome and Henry Hoare III from Stourhead these three men strove to create the most picturesque landscapes of the mid-eighteenth-century. In this quest they were among a select band of enthusiasts who spent vast fortunes on their landscapes and were very careful and even competitive about what they created and who they employed to help them display their taste. In this they will not have been far from the mind of the Rev. William Gilpin who travelled the British Isles painting the most picturesque offerings from nature that men such a Sir Charles were creating in their own demesnes. Lauded by most but also sent up brilliantly by the famous caricaturist of the later eighteen-century, Thomas Rowlandson. 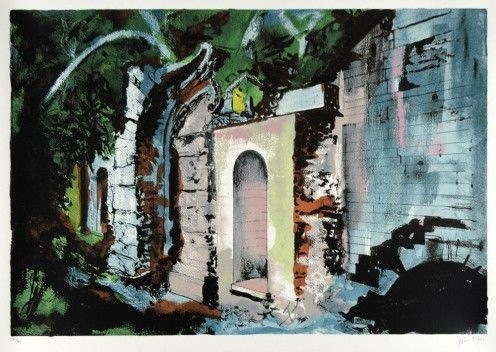 John Piper (1903-1992) “The Grotto, Halswell” Executed in 1987 at the invitation of Dr. Roger White to visit and paint Halswell. Dr White returns to Halswell again in April 2016 leading his group from the Oxford Graduates Architectural Society. 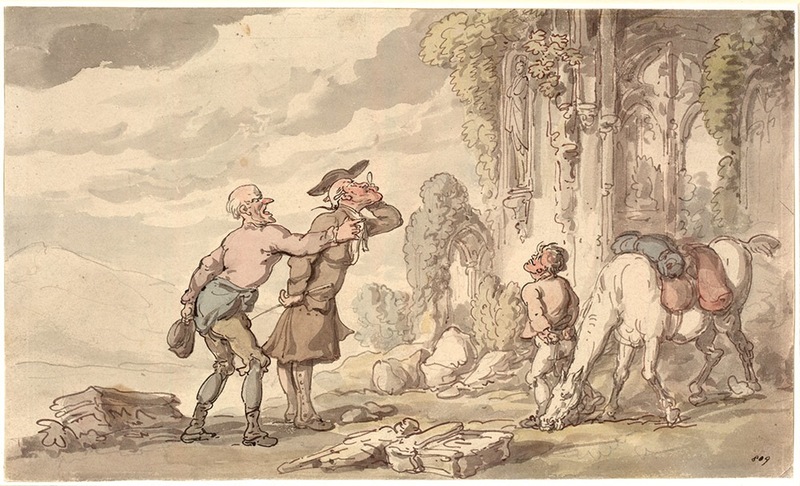 From the caricature of Rowlandson to the mystical nostalgia of Piper, the search for perfection in the built landscape is enduring. Coplestone Warre Bampfylde of Hestercombe, Temple of Flora at Stourhead (originally called the Temple of Ceres). 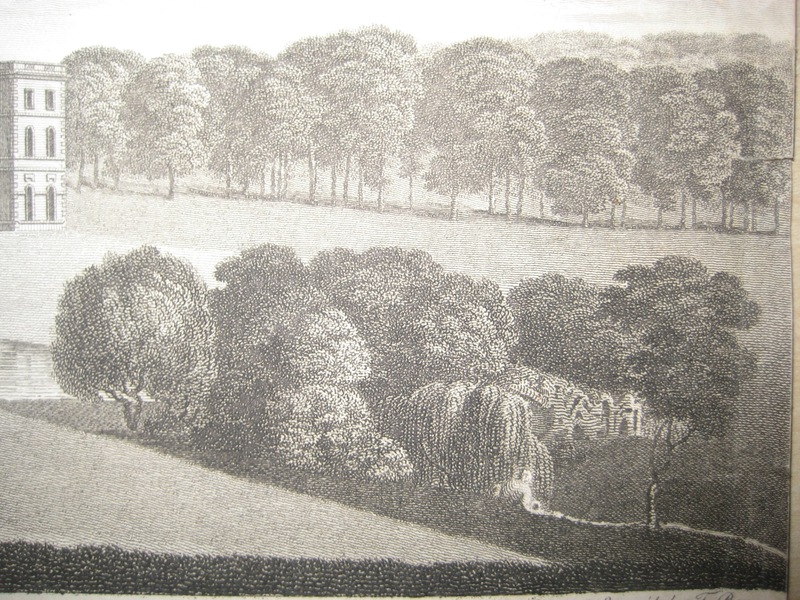 This picture pre-dates the building of the Stourhead dam in 1754. 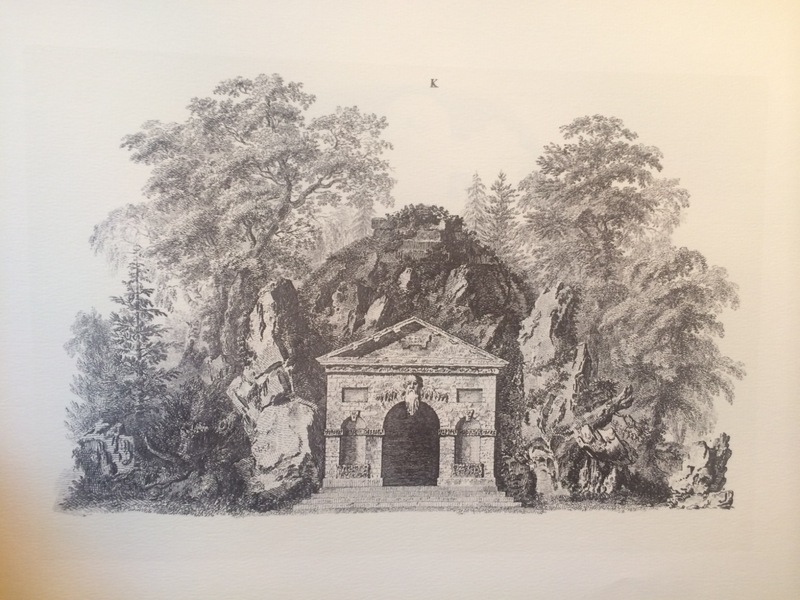 Mrs Mary Delany’s 1781 designs for a grotto at Bulstrode Park (house originally built for Judge Jefferys) for the Duchess of Portland. 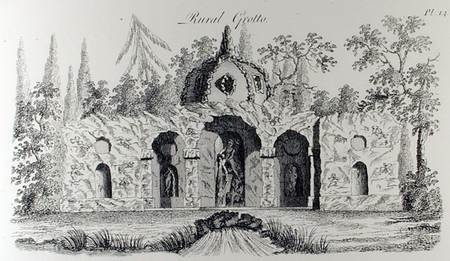 Rural Grotto, from ‘Grotesque Architecture or Rural Amusement’, by William Wright, published c.1767-90. 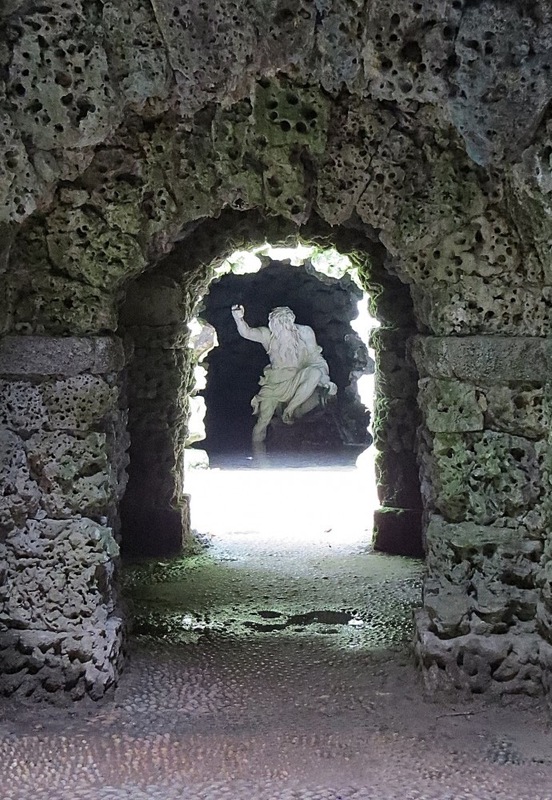 Inside the grotto at Stourhead, home of Sir Charles’s great gardening friend and rival Henry Hoare III. This rusticated stonework is similar to that used at Halswell throughout the water system. This River God statue at Stourhead is an extremely grand version of the type of river god statues which may have adorned niches of the Halswell Grotto originally, when water surrounded and cascaded down its façade. This article about the grotto, with the various drawings and photographs, has been the most personally interesting, so far.